Leap Motion today announced (via The Next Web) that Apple's former iAd chief Andy Miller is joining the company as President and Chief Operating Officer. 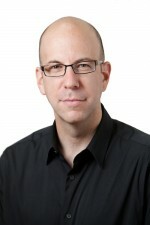 Miller was the founder of mobile advertising firm Quattro Wireless, which Apple acquired in January 2010 to form the basis of its iAd platform. Miller left Apple last August to take a position in venture capital. "I've been fortunate to work with some of the most influential figures and companies in the technology industry, and I'm as excited about the Leap as I've ever been about a technology," said Miller. "The potential for the Leap is limitless, as it is going to fundamentally change the way we interact with so many devices in our lives. I'm thrilled to come on board and looking forward to growing Leap Motion into the technology powerhouse it's on the road to becoming." I'm a fairly fit bloke, but dear Lord, my arms got tired just looking at this. Also, this makes the danger of having a cup of coffee on your desk increase at least tenfold. That's so cool. Maybe Apple should buy the company and incorporate the technology into the iMac and Apple TV. I feel like my arm(s) would get tired after a while of constantly holding them up in the air. Hell no I wouldn't want this incorporate into the iMac. Yeah it looks cool but do you understand how tired your arms would get from holding them up all the time. Magic trackpad > leap Mothion. I don't think people are grasping what this could do or how it could be used. Imagine one of these embedded where the current trackpad on mac laptops are. Now place your hands as if you were using the trackpad. Perhaps the palm of you hand is resting on the edge of the computer, perhaps slightly to the side, perhaps on a table or palm rest right in front of your laptop. Notice, your arm is completely supported. Now raise your fingers from the trackpad an inch or so. That's the position most people rest their fingers in when they don't want to touch the trackpad, right? Just hovering over the trackpad? Ok, that's the position you'll use a leap motion in. Same basic position you use a trackpad in, but now you get one extra dimension, and you never need to touch the device. Kinect is a low resolution device. That's why you need big arm swings to register movement on a kinect. Check out the video for this thing though. It looks incredibly accurate and it picks up very small moves. You won't be waving your arms around, you'll be wiggling your finger(s) around. You won't need to point to a physical location on the screen, you'll have an abstraction of the screen near your keyboard, the same way trackpads now abstract the screen onto a few square inches. In fact, they could build this thing 'under' the keyboard, eliminate the trackpad entirely. Want to control it? Just lift your right index finger from its position on the keys, pointed to the screen and wiggle it left right, up down. In a way, it returns us to the IBM trackpoint days, where you could use the mouse without leaving the home row, but with more flexibility, a larger 'canvas', multitouch, and 3 dimensions. We shouldn't need to take our hands off their position above the keys to use this, so it makes it better than current trackpads/mice. Leap looks incredible. I'd place a pre-order now but I'm not quite sure how well it'll do in terms of discerning the difference between my hands and my cat. Microsoft's Kinect is already doing this, albeit less elegantly. It's really a bit of an afterthought, to be honest. I'd rather pick up my remote and scroll over than use my hand to swipe left and right. Yay, aching arms as you sit at your desktop. It's a cool product, very clever and looks great for "SOME" uses, but again impractical for normal computer use. Sadly it will mean yet another VERY inaccurate way to control something on screen. Still impressive from a technical point of view. Perhaps another one of those great ideas, now let's find a real use for it type of products. Again, it's fun, and clever, but you are not going to want to sit at your desk and hold you arms/hands up controlling anything for any length of time.